The playwright Professor Femi Osofisan has quietly written a book on John Pepper-Clark Bekederemo, enigmatically titled JP Clark: A Voyage bearing the name the world knows him by still. All I can say is this: JP Clark, the book, is a masterpiece of quiet industry, prodigious intellect and simmering passion, one told lovingly by a master story teller. It is also an important book that should be handed out to every student of African literature. John Pepper-Clark Bekederemo’s contributions to African literature are muscular and this book makes that point eloquently and puts to shame any other biographical work that has been written on Clark (yes, let’s call him Clark). It also says to African writers, we can write and publish it ourselves, and write and publish it well. This lovely book can stand side by side with any biography written in the West and it will compete favorably. Bookcraft, the book’s publisher did an outstanding job, the editorial work was outstanding. It is a pretty book, with a handsome layout. I thought the collage of Clark’s headshot on the cover was inspired. This book was clearly a labor of love, a work of academic rigor. In using JP Clark as the book’s title, Osofisan forces the reader to wrap the mind around the JP Clark that we knew, that smoldering, enigma that has insisted on doing things his own way. JP Clark is the product of good research by someone trained to listen to oral folklore and reconcile it carefully with the written. This is a tale warmly told; the reader is at the feet of a story teller, lapping it all in. Read the book and sit enthralled as Osofisan weaves a touching tale about how the name Pepper came about. The book itself is poetry in motion, the pieces ofClark’s poems Osofisan showcases are mostly exquisite in how they chart Clark’s trajectory as a poet and as a person. His humanity is evident with all its dignity and warts and the reader bonds with this most complex of men who it turns out is not the curmudgeon that he makes himself out to be. JP Clark is a work of anthropology and sociology, a tender and balanced rendering of a complex life lived complexly. Osofisan deploys the rich language of a seasoned and impish playwright; this is a writer with enough self-confidence to appropriate the English language as his own and write is as he feels it. And boy does the reader feel this owner of words as the story is told with near clinical detail but with enough passion and skill to keep the reader thirsting for more. This is one important book, not lazy drunken opinions hurriedly stapled together for a quick buck. And desert have taken over the road. The book starts out with Osofisan heading out with the writer Olu Obafemi to Clark’s home in Kiagbodo. Touching is the journey itself, there is an easy camaraderie between the two writers as they banter and trash talk their way to Clark, to this beautiful once idyllic place. Avuncular beyond his years, his relationship with Obafemi is a study in the enigma and mystery of friendship. 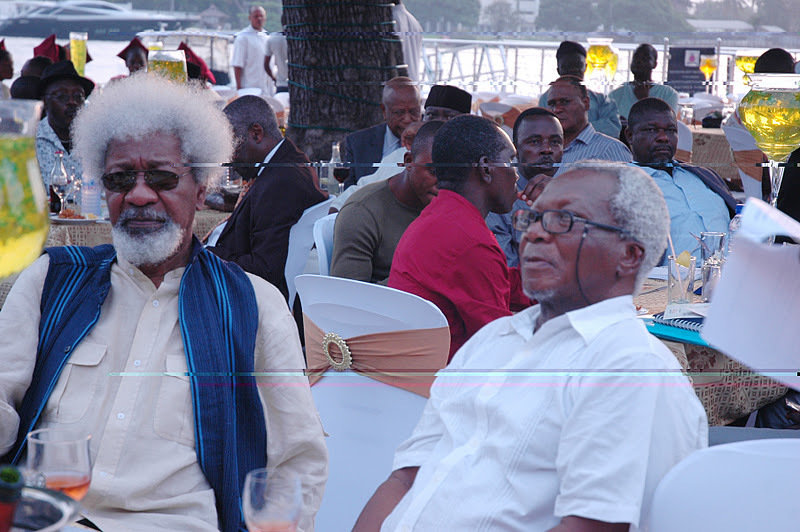 He records Clark’s tempestuous relationship with the fellow writers of the time, principally, Chinua Achebe, Wole Soyinka, Christopher Okigbo, Odia Ofeimun, their loves and their spats, which revolved around ideological differences, different ways of seeing the world as writers and activists, differences which came to an explosive head during the Nigerian civil war. Clark gained fame or notoriety for refusing to side with Biafra. It would be a shame for this important book to gather the dust of indifference. It would be great to have Osofisan and Clark at a forum discussing the many rich subjects covered in this book. This book ought to end up in a digital library with hot hyper-links to the numerous documents, photographs and sources mentioned in the book. What will happen to Clark’s papers? What will happen to Osofisan’s papers? It is not a perfect book. Sometimes, it is not clear where Osofisan’s source quote is from and that can be frustrating. I could not place in the book, when Osofisan and Obafemi traveled to Kiagbodo; the journey is undated. There is a helpful bibliography in the end, but I wondered if Osofisan read Soyinka’s memoir You Must Set Forth at Dawn. It is referenced in the book. In the book, Professor Ebun Clark, Clark’s wife, a pioneering literary authority in her own right cut a quiet dignified figure in the background. I thought about her, Flora Nwapa, Buchi Emecheta and all the other unsung women writers of their generation who toiled quietly but with determination in the shadows of strong men who would not share, these Virginia Woolfs of their generation and my heart sang solo songs for their courage and grit. I wanted to know more about Ebun Clark and her fellow female writers like Flora Nwapa and Buchi Emecheta. They were at best brilliant footnotes, propping up their husbands’ dreams for the most part in a patriarchy. I thought about Osofisan’s treatment of the turbulent events in Nigeria starting from the Chukwuma Kaduna Nzeogwu-led 1966 coup to the Nigerian civil war that claimed many lives. It could have used a more in-depth look and I wondered if his analysis was colored by his own biases or politics. You would have to read another book to get more out of that history. But as they say, you can’t get everything out of one book. What I got out of this book has earned Professor Femi Osofisan my undying respect. Alagba Okinba Launko, I salute you. This is a great review of a wonderful book worth reading! Well done sir!! ‘…. waste reams of trees writing about the environmental devastation in Nigeria’s delta’. Good prose and incisive irony, there. This is an exciting review and l enjoyed its highlights of the book’s highpoints, baiting and teasing the reader of the review to go for the real thing. I had a wide laughter at Ikhide’s asides to Maja-Pearse’s work. Fact remains history is a contest of shades of pales. Does The West set the standard, or is it that the standard is set in The West? You really do this review things well. Lousy review.Just like his paranoid references to Adewale Maja-Pearce’s own book on the same subject shows his intolerance of unfavorable perceptions of his beloved Clarke, Ikhide’s review is one syrupy, maudlin praise of a one dimensional portrait of the truly obnoxious poet and playwright. Well, the sign says “DANGER: Do Not Take This Baba Too Seriously”. Read the review, enjoy it if you can, leave a reply if you have a mind to, but just generally walk away, bidding good riddance to what might not be such a bad rubbish, if you can stomach it.